I sometimes buy issues of Australian Vogue Entertaining and Travel for inspiration. The editors seem to be as enamored of pastry as much as the rest of us. In one particular issue a few years back, their photos captured an amazingly gorgeous array of pastries from so many different worldly traditions, all found in some of Sydney’s best pastry shops. It is there that I spied a Hungarian Chocolate Kuglof from Wellington Cake Shop in Sydney. The photo was enough to pique my interest in creating one. 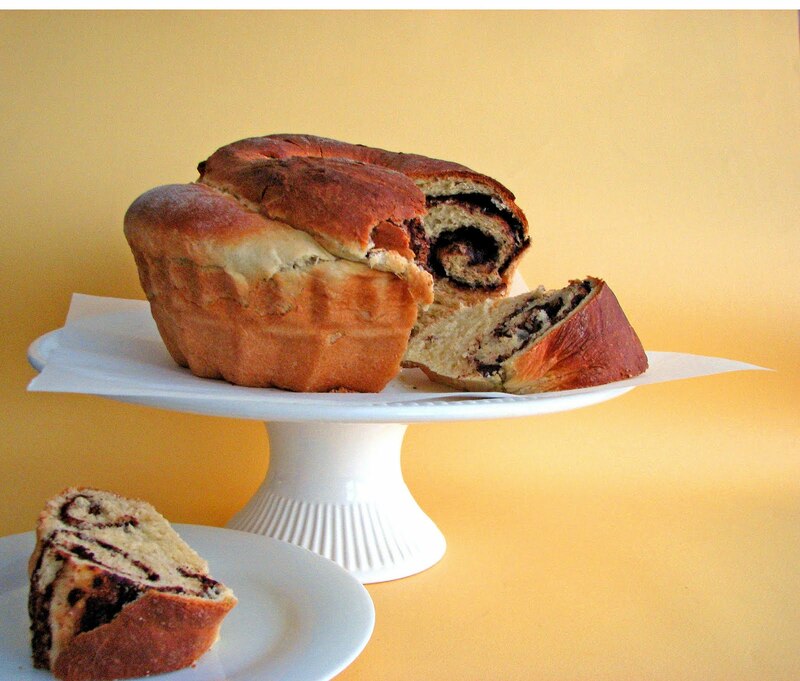 The Kuglof appears to be of the same family as the Gugelhupf or Kugelhupf and the Babka or even Baba, all of which come from a rich tradition of Eastern European cakes that have graciously found their way into our international repertoire. Some are yeasted, some are not. Some are filled with currants or raisins and others with chocolate or cinnamon sugar, candied orange or almonds. All of them are to be savored at every opportunity. Sometimes these style magazine recipes work out, sometimes they don’t. This one surely did. With just a couple of minor tweaks in method and ingredients, I mixed this together in no time. The finished product is a light yeast cake reminiscent of brioche with just enough sweetness, chocolate and spice to trigger all your Eastern European pastry café fantasies. It’s easy to see why Kuglof has survived the ages and sits proudly in a pastry display in Sydney. Serve with a cup of your favorite tea or strong coffee and you’ll be lost in a very long history of quiet and blissful enjoyment. - I increased the flour in the dough from 2 3/4 C to about 3 C as it was very, very sticky. As you mix the dough together, if it feels too sticky, keep adding flour just a bit at a time until it isn’t sticking to your fingers and you’re able to knead without any resistance. 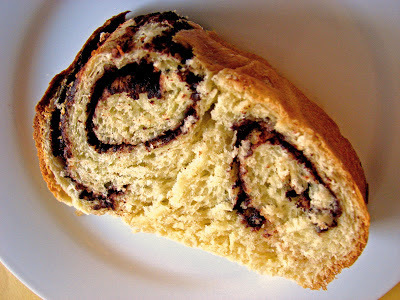 - The recipe called for simply dusting the dough with cocoa powder and sugar and dotting with butter. I decided to bloom the flavor of the cocoa in the butter and add a splash of Grand Marnier to make a thin paste. I added cinnamon to the sugar used in the filling and some vanilla to the dough. You could also try it with 1/4 t quality almond extract in the dough. - My Kuglof had a rounded bottom so I didn’t bother turning it right side up. Generously slather an 8” Kugelhopf mold or tube pan with soft butter. Gently warm the 3/4 C milk. Place 1/4 C of the milk in a bowl and sprinkle the yeast over it along with a pinch of sugar. Let stand for 5 minutes until the yeast is dissolved. Stir in about 2 – 3 T of the measured flour to make a sticky dough, then cover and set aside in a warm place for about 30 minutes. Gently re-warm the remaining 1/2 C milk with the 4 oz butter until melted. Cool to lukewarm. Beat the eggs together with the vanilla. Whisk together the remaining flour, sugar and salt in a large wide bowl and make a well in the center. Place the lukewarm milk/butter mixture, beaten eggs/vanilla and the bit of risen yeast dough to the center of the bowl in the well. Work all of it together with your hand, first mixing the ingredients in the center and then working in the flour around the edges bit by bit. The dough should take just a couple of minutes of mixing to form a smooth dough. If it’s too sticky, keep adding flour a tablespoon at a time until it forms a soft and pliable dough. Turn out the dough onto a lightly floured work surface or piece of parchment and knead for about 5 minutes until smooth and elastic. Place the dough in a large wide bowl that has been generously oiled, turning the dough over so the top surface is oiled. Cover the top of the bowl with a light cloth or piece of plastic wrap and set aside in a warm place until the dough doubles in size, about 30-40 minutes. For the filling, melt the 2 oz butter and take off the heat. Whisk in the cocoa and Grand Marnier to make a thin paste. Whisk until there are no lumps. Set aside. In another bowl, stir sugar and cinnamon together and set aside. When the dough is ready, divide it into two pieces and roll out one at a time on a lightly floured surface or piece of parchment to about 13” x 8”, the length depending on the circumference of the base of your pan. 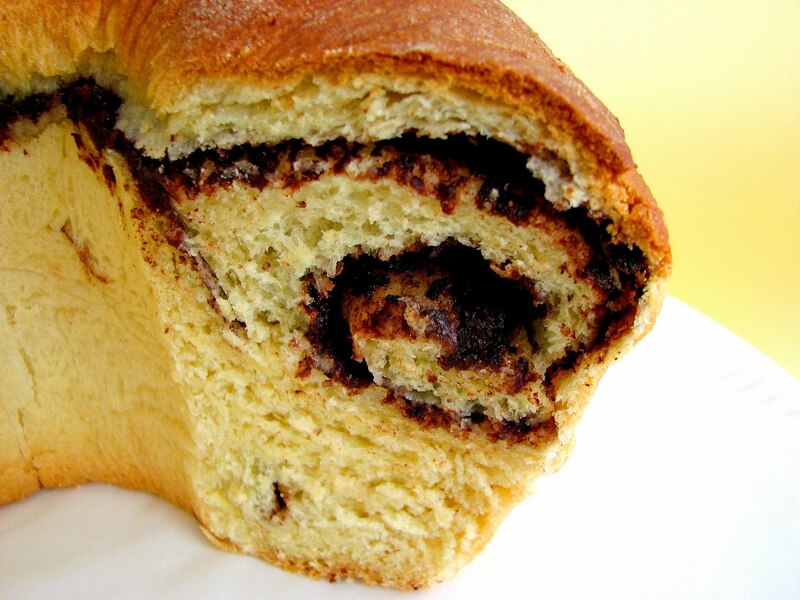 Spread half the cocoa butter paste on the dough and sprinkle with half the cinnamon sugar. Roll up the dough into a log starting at the longer side. 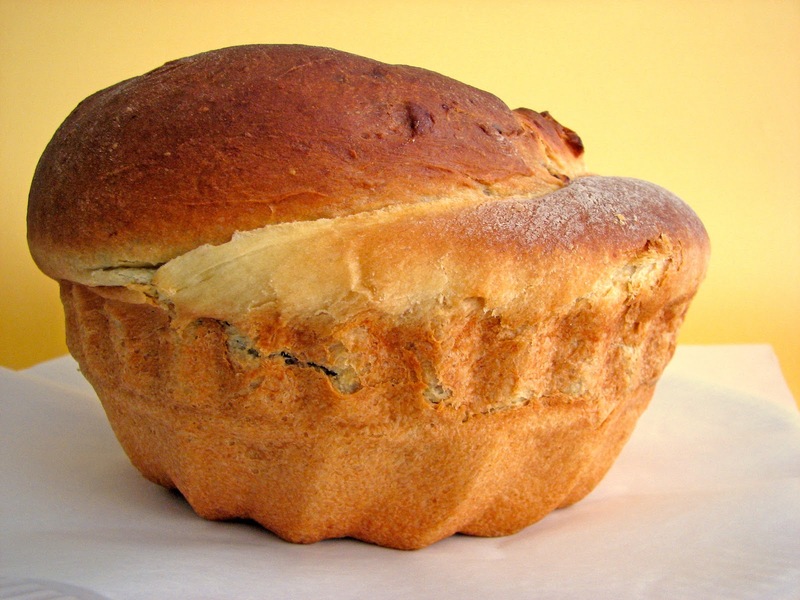 Lift it gently and place into the buttered kugelhopf or tube pan and pinch the ends together to seal. Repeat with the second piece of dough and stack it on top of the other piece, forming two rings inside the mold. Overlap the ends of the log and tuck under. Set aside in a warm place until the dough has risen to about an inch from the top of the mold, about 30 to 45 minutes or so. Preheat oven to 375 degrees. Place the mold on a baking sheet and bake for about 35 to 40 minutes, until it’s risen and browned. If the top browns too quickly, cover with foil and continue baking. Remove from oven and place on a cooling rack for about 10 minutes, then turn the Kuglof out on the rack to cool completely before slicing. And your fillings, IMO, is much better than the one the recipe called for. I had a German chef instructor at culinary school who was completely obsessed with bread baking so he had as make experiments with a similar loaf (omit salt, add more yeast, etc). So we ended up making that bread about 10 times and it was so interesting. The texture is amazing Gayle! PS: And I am obsessed with Vogue Entertaining and Travel too! This looks sooooooooo good and yummy!! I have to make this soon! This is absolutely beautiful, your pictures are wonderful! So beautiful! I'm Hungarian and I will make my family very happy by making this. Wow gorgeous, it looks so delicious! I love Australian Vogue Entertaining too! I have a stack of issues that I bought in the early 1990's that I still look at. This looks amazing and I'm going to have to make it. Wow, I'd sure love to dig into this at Sunday brunch! It looks awesome! That looks great! I really like the swirling patterns in it. Oh Auntie, this looks divine!!! Looks so delicious! I'm embarassed to say I live in Sydney and don't think I've ever visited the Wellington Cake Shop!